For several weeks, the issue of SunTran control has been bouncing around the City Council Chambers and the media. 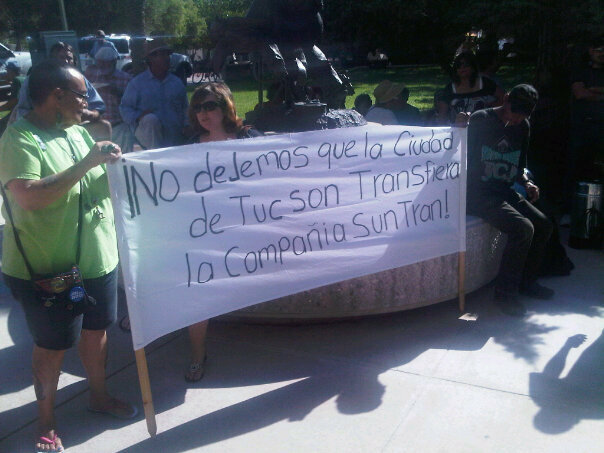 Today as the Tucson City Council considered whether or not to relinquish control of the SunTran bus service to the Regional Transportation Authority (RTA), pro- and anti-RTA demonstrators gathered outside (1, 2). The Teamsters Union (below) supports the move to RTA because they believe the RTA will provide a more stable funding source for the bus service and, therefore, the union members. Bus riders and representatives from Casa Maria Soup Kitchen (above) protested against the move to RTA because they fear steep fare increases and cuts to services if the regional authority takes over the buses. Yes, the city is strapped for cash, but I disagree with the proposal to transfer SunTran to the RTA. First of all, the vast majority of SunTran riders (in the neighborhood of 80-90%) are residents of the City of Tucson; this alone should be reason enough for the city to retain control. SunTran riders are people who don’t have other transportation, can’t afford to park or can’t find parking where they work (ie, the University of Arizona), or can’t drive, ride a bike, or walk to their destinations. Often– but not always– these people just can’t afford cars. If SunTran were controlled by a regional authority, Tucson would have one equal vote along with several smaller suburban cities– such as Oro Valley or Marana. Obviously, potential suburban bus riders have different needs than the poor people and students who ride the city buses. Although Tucson is the biggest city in this group and has the most riders, it would be one voice among many at the RTA table. 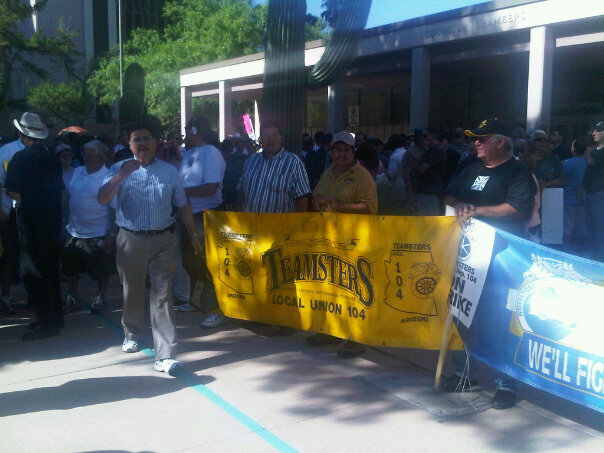 RTA claims that it has solid funding, and this is why the Teamsters are supporting the RTA take-over. According to a radio interview between former City Councilman Steve Leal and activist Brian Flagg of Casa Maria, RTA would increase fares– perhaps even doubling them– if they take over SunTran. The tragedy of all of this is that it pits workers who are fighting for their jobs and a living wage, against riders, who are fighting for affordable transportation and a means to get to their jobs or school. These groups should stick together, rather than battling against each other. At the end of the day, drivers and riders have more in common than they may believe today. >Great job, Pamela. I agree with your arguments wholeheartedy. As President of El Rio Neighborhood Assn. I submitted arguments opposed to the transfer. The basis for these is that Sun Tran is an asset owned by the City and should not be relinquished without just compensation; and the people of my neighborhood would have no avenue for redress of such issues as route reductions or fare increases should the RTA attain control. This entry was posted on August 4, 2010 by Pamela Powers Hannley in Arizona, City Council, Tucson, unions and tagged Rio Nuevo.